Ask Doctor Vector: Quick, grab your brain--before it explodes! Quick, grab your brain--before it explodes! I am a big fan of big explosions. And I'm not ashamed about it. I also like to stare into the abyss, and I like having my mind blown by things that are unimaginably old and inconceivably immense. So maybe it was my destiny to work on sauropods. But if I wasn't so attached to dinosaurs, I'd be an astronomer for sure. Supernovas are good. It's hard to beat a big ole whammy-kablammy. But lately I've been drawn to planetary nebulas. Despite the name, planetary nebulas have nothing to do with planets, they just look a bit like planets through small telescopes, like mine, or the ones around a hundred years ago when they were named. In fact, planetary nebulas are shells of gas blown off over hundreds of thousands or millions of years by the death throes of dying stars. Some of these stars later go whammy-kablammy, which is probably the ultimate cosmic twofer for any observers with a few million years to spend watching. 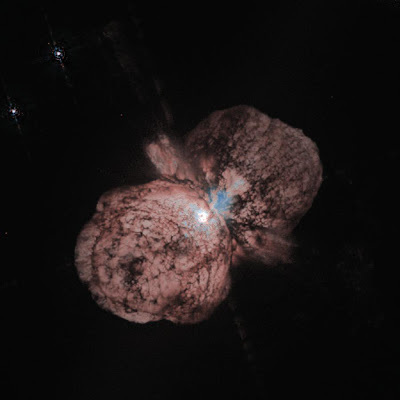 A good candidate for that is Eta Carinae, which has already blown off a sweet planetary nebula that looks like twin mushroom clouds, and which will probably go supernova or hypernova in the next million or so years. 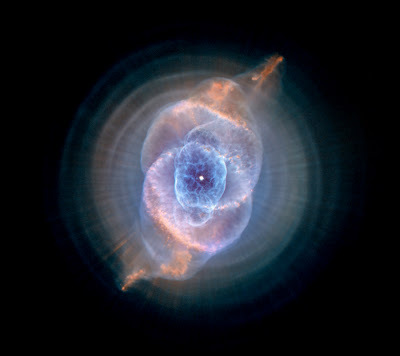 One of the best planetary nebulas is NGC 6543, the Cat's Eye Nebula,shown at the top of this post. I've had it as my desktop background since last June. Completely by coincidence, it is one of the things I got to see through the awe-inspiring and hellanormous Lick refractor last September. Supergiant stars blowing off immense glowing clouds of gas over millennia are pretty good, but even better are giant jets of crap blasted out by galaxies. That's right, folks. Galaxies. 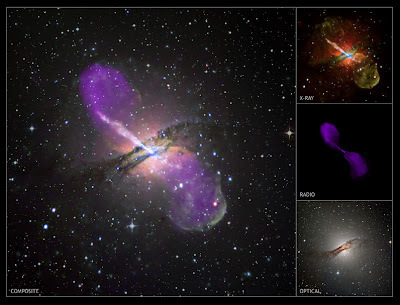 Active galaxies, like Centaurus A here (awesome composite stolen from APOD), emit huge jets of energy from their cores. These jets have their origins in the accretion discs around the central black holes, which eat stars for breakfast. And look at the pretty pictures, which are of real things that really exist in our universe. And try not to let your brain explode. Damn. You really have a knack for causing me physical harm over the interwebs. Seriously, just 5 minutes I read your review of Danny Taylor's paper which nearly made me choke. Now this unrepairable brain damage. 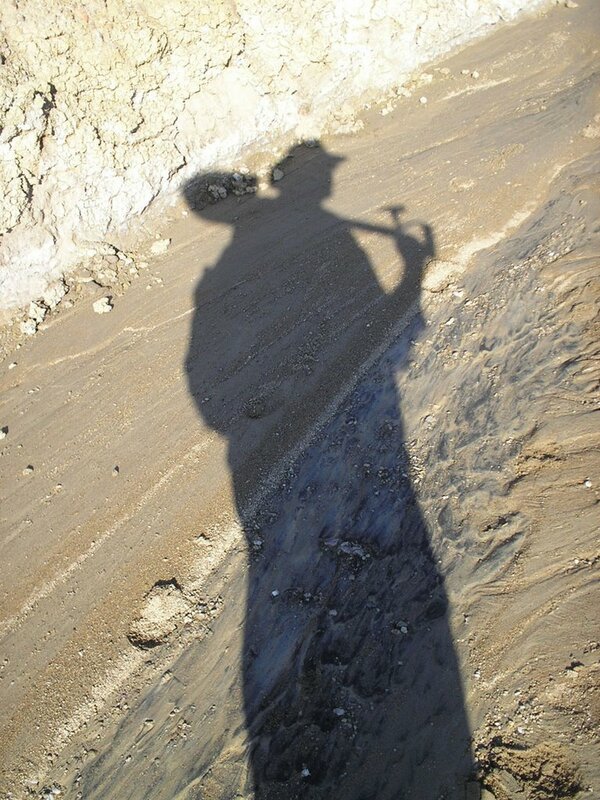 I've been reading your recent posts this evening and I'm impressed by the writing and choice of photos. I got here from a comment you made on Tetrapod Zoology, one of my favorite blogs. Keep it up! Thanks, Larry! Any TetZoo fan is okay by me. Darren only thinks he has a blog. It's really a single-author e-journal that publishes concise review papers on tetrapods.